The 2018 Farm Bill, which was signed into law last month, includes provisions removing hemp and its extracts, including hemp-derived cannabidiol (CBD), from the DEA’s Controlled Substances schedules entirely. This is a monumental shift for industrial hemp and CBD in the US, and it promises big opportunities for CBD merchants and the payment facilitators that onboard them. However, these new allowances for CBD come with some important stipulations. For payment service providers, the bottom line for now is that merchants selling CBD still present considerable uncertainty. Below are the top three factors PSPs should assess before onboarding merchants selling CBD. Make sure CBD products are not marketed as a food product or dietary supplement. According to the FDA, under the Food, Drug, and Cosmetics Act (FDCA), it is illegal to market CBD as a dietary supplement or otherwise introduce it into the food supply. This could change in the future: Oregon's two senators recently urged FDA commissioner Scott Gottlieb to update federal regulations to permit interstate commerce of food products containing CBD. For now, however, merchants in most cases may not sell CBD for human consumption. Make sure merchants do not make disease claims about CBD. Unless a product is approved as a drug by the FDA, it may not be marketed with express or implied claims that it is intended to cure, mitigate, prevent, or treat a disease (or any similar verbiage). This includes language on product labels, websites, and any related social media. Although many believe CBD has the potential to treat or mitigate a variety of ailments, making these claims in conjunction with the marketing or sale of a product is impermissible without clinical studies and FDA approval. Make sure merchants are only selling CBD in jurisdictions where it is legal. Though there are likely to be changes in the coming months and years as states decide whether to adapt to the new federal approach, there are multiple states that impose restrictions or outright prohibitions on CBD. For example, in Idaho, hemp-derived CBD is regulated as a controlled substance. Regulations around CBD may change significantly in the near future, especially at the local level, so it’s important to keep abreast of these changes. Want to learn more? 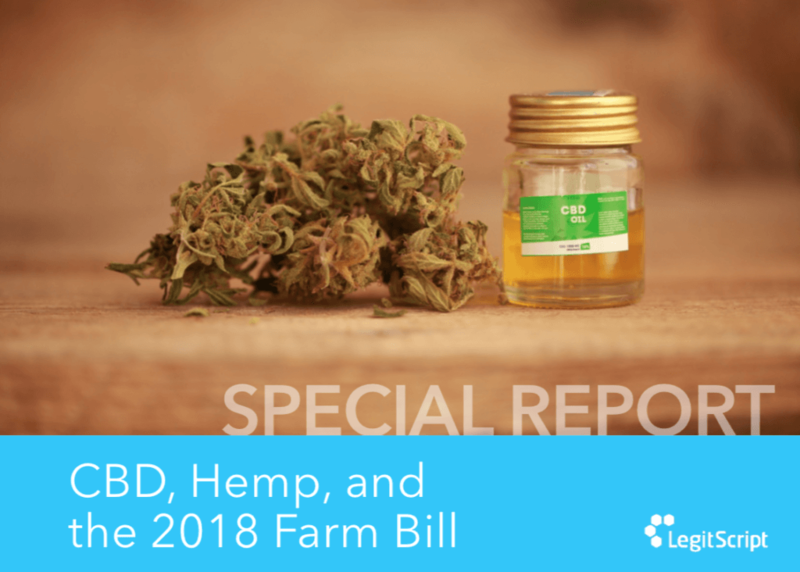 Get our new report on CBD, Hemp, and the 2018 Farm Bill. In it, we provide helpful resources and answers to common questions about the murky subject of hemp and CBD regulations. FDA regulations and laws in local jurisdictions make navigating CBD sales complex and potentially problematic. Before payment service providers think about onboarding merchants selling CBD, it's important to be well-versed in legal regulation of the product and aware of potential restrictions by card brands. Partner with LegitScript to keep abreast of the latest trends around this controversial product. Alongside the world's largest database of health-related products and ingredients, LegitScript has created a leading team of experts in highly regulated and complex sectors. This includes expertise related to marijuana, hemp, and CBD. Contact us to learn how we can help you.